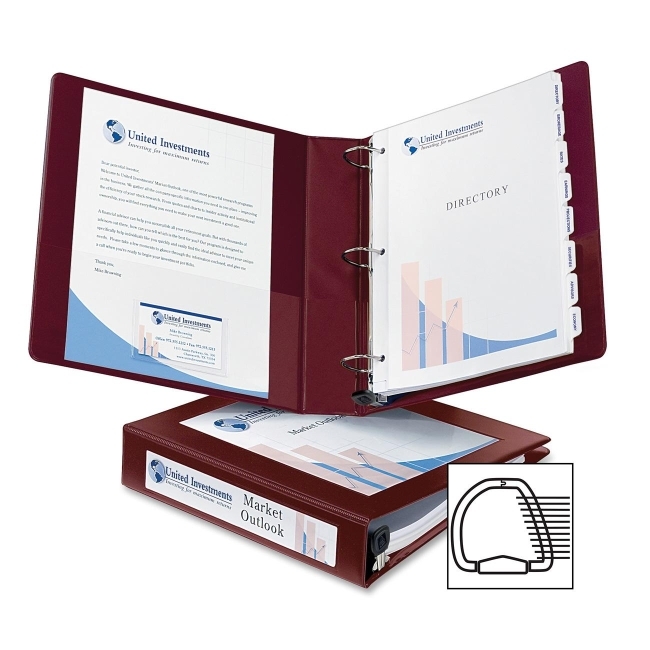 Binder perfectly frames and centers your title page for a professional look. Special mounting base keeps title page in place. Easily insert title page and spine ID with convenient mounting sheets. Overlay material on front and spine is crystal-clear. One-Touch EZD Locking Rings open with ease and keep pages secure. EZD rings also have a higher page capacity compared to same-size round rings. Gap-Free ring feature prevents gapping and misalignment of rings. Pages lie flat with these back-mounted metal rings. 1-1/2" ring capacity accommodates approximately 400 sheets. Binder also features two clear interior pockets, a sturdy chipboard core, and exposed rivets on back. Each pocket holds up to 20 sheets. Wider front and back binder panels fully cover standard dividers and sheet protectors so you can keep your paperwork and tabs protected. Binder is made with heavy-duty vinyl.